There's nothing I like better than reading a good book. While I was on my semi-bedrest, I read the Eragon series. Although not along the lines of what I normally read it was very enjoyable. I liked it so much I tatted a dragon the same color as Gladr in the the last book. Here he is! The pattern is from Ann Buvold and can be found here http://www.nuperelle.net/index.htm. Anyway, I make it to the end of the book and there was no END!!! Arrrgh!!! It leaves you hanging saying now that the trilogy is now going to have a 4th book which of course has not been finished by the author. Don't you just hate it when this happens! Ugh! So I will wait impatiently for the next book. Sigh. I'm still waiting. 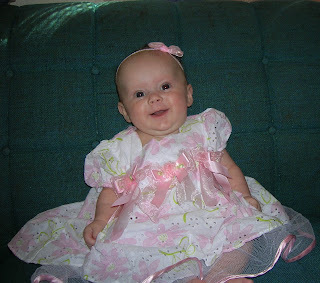 We had a really hot Sunday a couple of weeks ago so I dressed my baby girl in a new dress given to me by a friend. Isn't she pretty?! Hi Everyone! Lots of things have happened here. Well as you know my daughter was born and we are now getting into a workable schedule. Ha! Sleep is for sissies! Caffeine is our friend. Seriously I'm loving being a Mommy for the second time. No. 1 son still doesn't know what to think of her. I'm hoping he'll warm up to her really soon! Here she is! Yes I have been tatting when I get a spare moment. Right now I'm working on baby booties. These are not for me they're for someone else. Isn't that the way it always turns out, you tat something that comes out gorgeous and then you have to give it away. Sigh. I do love tatting for other people and see the smiles. Well gotta run. I'll post some of the tatting I did while I was on semi-bed rest before my daughter arrived. Talk to you soon! Well this has been frustrating month for tatting I'm doing tatting I really am but can't show any of it because it's for my Secret Santa Exchange. Well of course that's been done and has been sent already but still I can't show anything. Here lately I haven't been doing any tatting at all! GASP!!! Why you might ask? Welll. . .
What is that? I know it's a lima bean!!! No. Let me introduce you to one of my presents and formally known as the curve ball! Yep I'm expecting! Although this may not sound like an astounding announcement. I assure it is! You see I'm 40 something years old and didn't think that I would be able to have another child. In fact my OB doctor ask my birthdate 4 times and then I laughed and said okay let's not pass out yes I am that old! I did have a miscarriage in May of this past year which was very heart breaking. So I am nervous and excited about this one. I give God all the glory for blessing me with a new little one! We go for another ultrasound on Christmas Eve. Yep that's right Christmas Eve morning as if I did not have enough to do! ROFL They are sort of freaked out about my age. Well anyway that's all for now. Oh before I forget someone asked me about the snowflakes I did and put in my Christmas cards. Those have been sent and I usually hear comments about them when I go and visit over Christmas. So I'll give an update about how they liked them after Christmas. Maybe then I'll have time to hunt down all my widgets that I lost changing my blog background. Wooo Hooo! It's almost here! I've been making my Christmas list for DH with lots of tatting books, thread you know the essentials. Still no pictures of tatting to show as I'm not allowed to show what I've been working on because what I have been working on is my Secret Santa Exchange which I will show after Christmas and after my partner has received it. I know bad, bad, bad girl but hey those are the rules complete secrecy until after your partner receives it and we can't open our exchange packages until after Christmas. I put up my Christmas tree. Yeah! I would have it up before Thanksgiving but DH will not let me put it up that early. Oh well. I still can't tell you what the curve ball is but it is very exciting and I am extremely happy. Not to worry I'll spill the beans soon but for right now I'm working like mad on getting my tatting done. I changed my template to reflect the season. Pretty neat huh? Unfortunately I lost all my extras that I was keeping to the right. So I'll have to hunt for them again as well as my blog list. Ugh! One day I'll get better at this computer thing. LOL Merry Christmas Everyone! No pictures of tatting today although I've been tatting hard and heavy to get everything done. My time was taken up this past week getting ready for this past weekend's craft fair. I was mainly working on my painted gourds. I also like to demonstrate tatting when I'm doing a craft fair. All in all it went pretty good. I sell tatting and gourds to make a little extra spending money to spend on. . . .
Give up? To spend on more tatting supplies of course! Wooo Hooo! I have an observation about craft fairs and a little complaint, now don't run away just a little complaint. I have increasingly noticed that when I show my tatting at craft fairs there are a lot of other stuff there. For example, at this last craft show I did this past weekend, Hot teas and house plants are not a craft. Tupperware, Pampered chef and Premiere Jewelry are also not crafts. Worst of all there was a chiropractic clinic there advertising for their clinic. DEFINTELY NOT A CRAFT! Wouldn't you think? Sorry it just irritates me a little when I do a show and there's stuff like this being sold at a "craft" fair. I've been to one show where a vendor beside me was selling costume jewelry and not the kind made by her but store bought stuff. Ugh! Nice people but still not what I would consider a craft. On the up side though I have shown what tatting is and a lot more people are starting to recognize it. I got a lot of questions about tatting so that was fun talking to people and demonstrating. Oh still have no news on the curve ball I mentioned earlier but stay tuned it's coming. I have to go get the son up for school. Hi Everyone! Wow has it been that long? Sorry about that. Life sort of threw me a curve ball of a surprise. But we'll save that for another post. On to tatting and what you've all been wondering about, how did my gloves do in the fair? Well. . . I GOT A RED RIBBON, SECOND PLACE! Isn't that cool! I'm one away from the elusive blue ribbon. LOL My doily unfortunately did not place. However, I'm not disappointed about that as I sort of entered it on a whim and originally had not planned to enter that one at all but did it anyway. Also remember the baby booties I was working on well finished those too just in time for the baby shower and she loved them. I actually got a couple of inquiries on me teaching a few how to tat. Wonderful! More potential tatters. Soon we'll take over the world! Bwa ha ha ha ha! Ahem, I digress. Well anyway here's a pic of the booties the patten in from Sharon Briggs' newsletter which she is no longer publishing (sniffle). They are lovely! Oh I did count up the knots as someone always asks how many knots and how long it took me to make a certain item. A friend of mine counts her knots which I think is a grand idea. Obsessive, hmmm maybe but still a grand idea! Anyway in one bootie there are 6,512 knots. That's for one! So needless to say aching hands had to take a rest after 4 weeks of continuous tatting. So now it back to Christmas tatting in earnest. As to the curve ball you'll have to stay tuned for that one.